2. 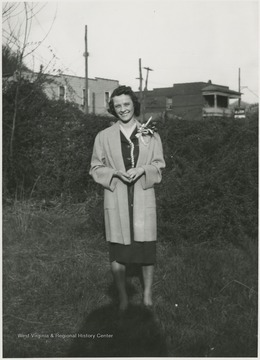 Helen Helms, Hinton, W. Va.
Helen Helms, Hinton, W. Va.
Helms pictured at 112 Greenbrier Drive in the Bellepoint section of town. 3. 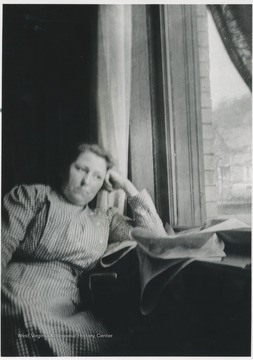 Mrs. Hoover, Pineville, W. Va.
Mrs. Hoover, Pineville, W. Va.
Hoover looking out the window. 4. 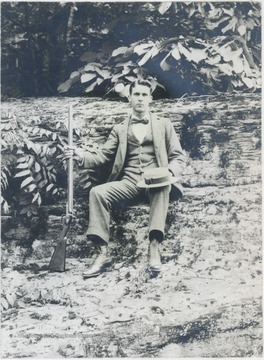 Samuel Hight of New River, W. Va.
Samuel Hight of New River, W. Va.
Hight pictured sitting on a log and holding a rifle. 5. 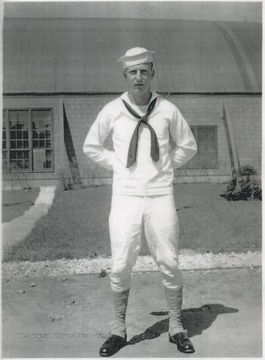 "Crow" Hellems, Hinton High School Football Player, Hinton, W. Va.
"Crow" Hellems, Hinton High School Football Player, Hinton, W. Va.
Hellems pictured outside the bleachers in his Bobcat team uniform. 6. 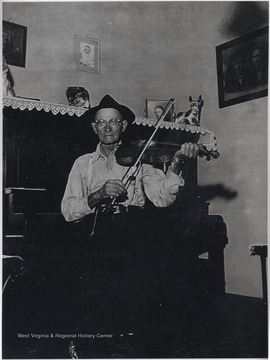 Howard Hartford Playing His Fiddle, Hinton, W. Va.
Howard Hartford Playing His Fiddle, Hinton, W. Va.
Hartford pictured playing his instrument at the 1717 Temple St. residence. Hartford made fiddles and clocks, and was known for his mastery in woodcraft. 7. Sam Hartley and Herb Kiser Pose Behind Cut-Out, Hinton, W. Va.
Sam Hartley and Herb Kiser Pose Behind Cut-Out, Hinton, W. Va.
Hartley, left, and Kiser, right, pose behind a cut-out that makes them appear as if they were in a hot air ballon. 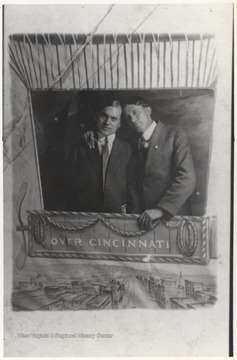 The banner on the poster reads, "Over Cincinnati". Hartley was a C & O Railroad train dispatcher and Kiser was a telegraph operator. 8. 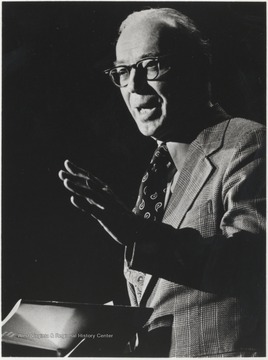 Former Congressman Ken Hechler of Summers County, W. Va.
Former Congressman Ken Hechler of Summers County, W. Va.
Representative Hechler pictured holding a book and speaking to a subject outside of the frame. 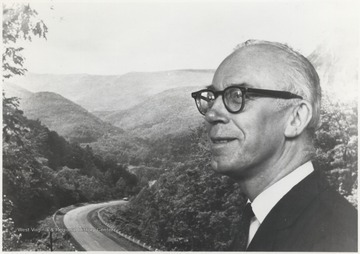 The former congressman pictured in front of a picturesque West Virginia scene. 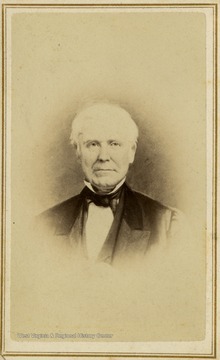 Representative Hechler was also West Virginia Secretary of State and an author. 10. Portrait of Kenny Hetchings in Bluestone River Valley, W. Va. 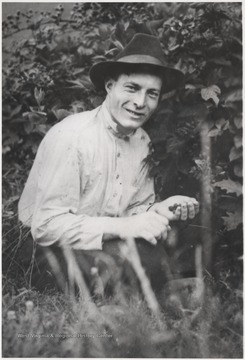 Portrait of Kenny Hetchings in Bluestone River Valley, W. Va.
Hetchings pictured holdings wild berries near the town of True. 11. 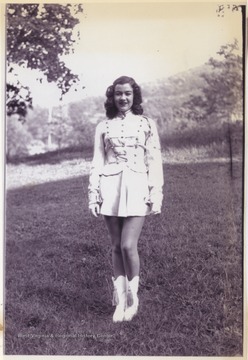 Phyllis Honaker of Summers County, W. Va.
Phyllis Honaker of Summers County, W. Va.
Honaker pictured in what appears to be a marching band uniform.